What does the Coastal Zone Mean to You? Ka ʻili hau pā kai o ʻAlio. Wet be the sea sprays of ʻAlio. This is a reference to a strong shore-dweller. Salt air and sea sprays make the bark of the hau trees on the shore stronger than those of the upland. ʻAlio is a place on Kauaʻi. Ka ʻia a ka wai nui i lawe mai ai. The fish borne along by the flood. The ʻoʻopu , which was often carried to the lowlands in freshets. Neʻeaku, neʻe mai keone o Punahoa. That way and this way shifts the sand of Punahoa. Said of a group that divides, or of an undecided person who shifts one way and then another. The coastal ecosystem is located at low elevations at and near the seashore surrounding the whole of Haleakalā. The coastal ecosystem encompasses many different plant and animal communities, the composition of which are greatly influenced by proximity to the ocean. Physical and behavioral adaptations that enable organisms to tolerate high salt concentrations and other drying conditions are common in the coastal strand, where salt spray and seawater are strong influences. In other parts of the coastal zone, salt spray and seawater are not influences, and vegetation is determined more by the amount of rainfall. Windward coastal areas may receive up to four times more rain (up to 300 centimeters or 120 inches per year) than leeward areas, with strong winds being common. Coastal plants grow on substrates that range from old coral colonies to basalt cliffs and boulders, and from sandy beaches to lava and ash. 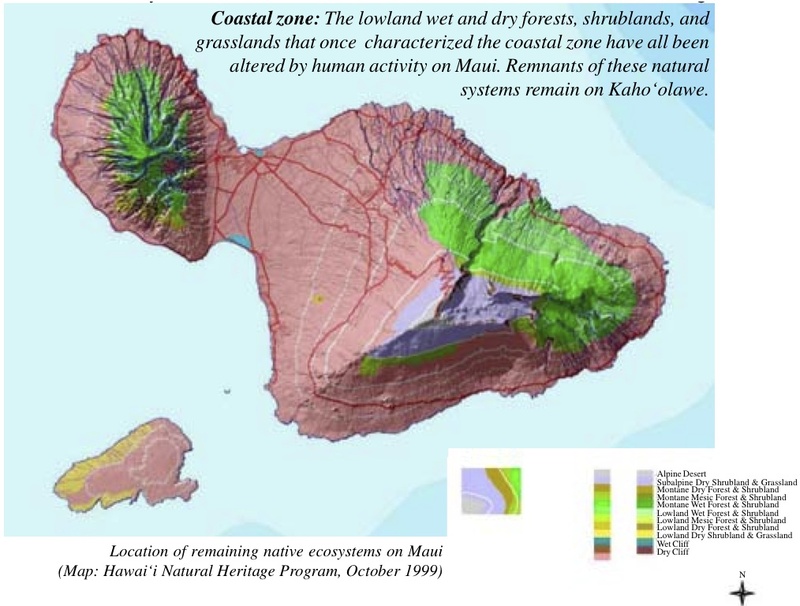 Compared to other ecosystems on Maui, the coastal zone has a higher ratio of indigenous to endemic species. Proximity to the ocean makes the coastal ecosystem less isolated than other ecosystems. An ongoing influx of new organisms—and genetic input—is more likely here because of the ocean currents, so large numbers of endemic species have not evolved in the coastal zone. At one time, many coastal areas were covered by shrubby native vegetation including naupaka and maʻo (Hawaiian cotton), or even forested with trees such as hala, hau, and loulu, the native Hawaiian fan palm. The phenomenon of “zonation” is typical in coastal environments, particularly near shoreline. Zonation refers to a progressive change in types of organisms or plant and animal communities linked to habitat conditions. In the coastal zone, the determining conditions are salt concentration and availability of fresh water. Of the life zones on Haleakalā, the coastal ecosystem is perhaps the one that has been most altered by human activity. Most coastal areas have been and continue to be heavily used by humans and altered by activities such as cattle grazing, draining or modifying wetlands, and recreational, urban, or resort development. Today, many people know this zone as a place to live, go to school, shop, and play. From the few remnants of native coastal shrublands and forests that remain today, it is difficult to form a clear image of coastal ecosystems before human habitation. Today, nonnative plants, such as kiawe and koa haole, dominate many coastal areas. Introduced rats, cats, mongooses, and dogs prey upon and harass nesting turtles, water birds, and seabirds. Development continues to alter this much-used ecosystem. On the other hand, protected areas, such as Keālia Pond National Wildlife Refuge and ʻĀhihi-Kïnaʻu Natural Area Reserve, do exist. In some coastal areas, dune restoration projects and efforts to plant native coastal vegetation are helping to bring back small patches of the native ecosystem. The traditional system of dividing the Hawaiian Islands into political regions, the ahupuaʻa was the most important land division. Ahupuaʻa usually extended from the mountains to the outer edge of the reef in the ocean, cutting through all of the major environmental zones along the way. Each ahupuaʻa encompassed most of the resources Hawaiians required for survival, from fresh water to wild and cultivated plants, to land and sea creatures. Because of their dependence on the land’s resources, the Hawaiians developed a complex system of resource management and conservation that could sustain those resources over time. Coastal areas were the most densely populated lands in ancient times because they provided easy access to abundant food and medicinal plants, as well as ocean resources including food plants and animals, and transportation. They continue to be important in Hawaiian culture, providing lei material, medicinal plants, and access to intertidal areas where marine plants and animals such as limu and ʻopihi are gathered. Even before the arrival of Europeans, the original vegetation of coastal lowland areas had been dramatically altered by more than 1000 years of Hawaiian use. 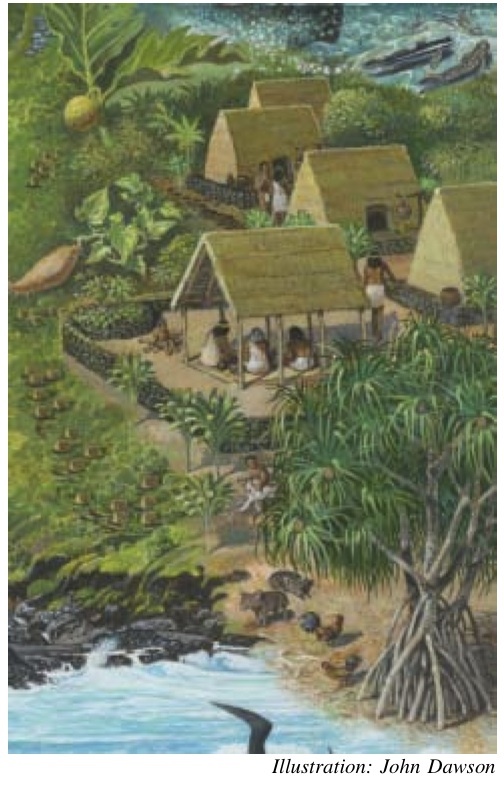 Agricultural practices such as dryland farming, and clearing and burning land for cultivation removed native vegetation, and for the most part, plants introduced by the Polynesian settlers took over once the fields were left fallow or abandoned. Native vegetation was also degraded in areas that were not cultivated through practices such as using fire to encourage the growth of grasses for thatching, gathering firewood, and taking timber for construction. • Listen to each ʻōlelo noʻeau and their exact translations. Finally, listen to the interpretation of the literal translations. • Pick one ʻōlelo noʻeau and explain why you think this expression was used. What does it tell you about the observational powers of the early Hawaiians, how they viewed the coastal areas, the living things there, and their own place in the landscape? Which ʻōlelo noʻeau shows an understanding of the connections between the upland streams and estuaries? • What kinds of landscapes come to mind when you think of coastal areas? What are your favorite areas and memories? • Is there a person who has taught you about the coast? If so, what have you learned from this person? Have students brainstorm all of the different kinds of land areas they can think of near the ocean, such as sandy beaches, gravelly beaches, rocky coastlines, cliffs, benches that contain tidepools, and wetlands such as Keālia Pond. Over a weekend, have students visit a coastal area of their choosing, observing the patterns of vegetation from the shoreline inland.